Motto: One for all and all for one. 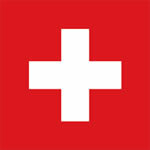 Switzerland have qualified for seven FIFA World Cup™ finals. In their début appearance in 1934, they lost a close quarter-final 3-2 to Czechoslovakia. Four years later, the Swiss booked their place in the quarter-final by defeating Germany 4-2. The eventual runners-up Hungary ended the Swiss run at the quarter-final stage. At Brazil '50 the Swiss team went out in the first round, but in the 1954 World Cup they played their way into the quarter-finals as the tournament hosts. But after leading 3-0, they allowed Austria to fight back to claim a 7-5 victory and semi-final spot. In 1962 and 1966 Switzerland failed to progress beyond the first round, and in 1994 they headed home after a 3-0 loss to Spain in the second round.